This is just a quick calculator tool I whipped up for sizing up a vSphere cluster, assuming your requirements are based on core counts and RAM. At least, this is one of the more frequently used sizing methods I’ve seen for new application / project deployments, so hopefully this will make life easier if you have to do such calculations. Utilization Ceiling (%) Before Redundancy: What is the maximum utilization allowed for the base cluster, without considering redundancy. Allows for possible growth, burst, and overhead. Preferably remain below 80%. Redundant Systems (n+x): Additional number of hosts to add into a cluster for redundancy for HA during failover scenarios. This is the number of host outages the cluster can sustain, before cluster capacity drops below either the Total Number of Cores or Total RAM specified above. Minimum number of hosts required: Minimum number of hosts required, defined by number of cores or RAM required, whichever is higher. Hosts required for redundancy: Number of hosts required after the addition of redundant hosts for failover scenarios. 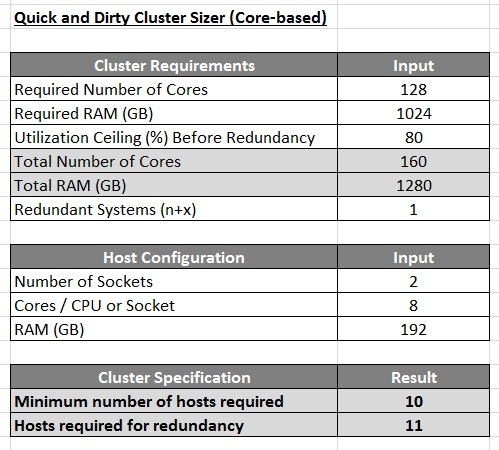 You can download the Quick and Dirty vSphere Cluster Sizer here. This program is provided as-is, without any guarantees/warranties, so do use it responsibly and be sure that you counter-check its results. It’s a tool for convenience, so feedback is always welcome on how to enhance the features! This entry was posted in Virtualization on March 24, 2013 by Wei Chiang.